Over the years, I've configured thousands of SuperAgent applications. I've refined the process, which includes a YouTube video (shown below) and an application flow diagram (detailed below) that I give to application owners to fill out. Usually they give me back their own version of the application infrastructure, which has more and less than what is needed for SuperAgent. That usually results in a meeting where I've taken their data and plugged it into my AFD and I solicit the missing information. So, what I've decided to put in this blog post should be everything needed to get started configuring applications in SuperAgent. Obviously, the SuperAgent administrator will need to know how to properly administer SuperAgent, but this primer is meant more for the application owners than the SuperAgent administrator. First, the video. This video is based on a bounce diagram presentation that I've given countless times and explains how SuperAgent works on a fundamental level. This is important information to present to the application owners so they know why we're asking for the application flow information. The purpose of this document is to describe a low complexity application and detail the parameters that must be obtained about that application in order to correctly configure the application for monitoring within CA Application Delivery Analysis (SuperAgent). This document also attempts to identify the types of people responsible for obtaining/providing that information about the application and infrastructure to the NetQoS administrator. Given the diversity of modern organizations, the recommended roles may not have the information required. 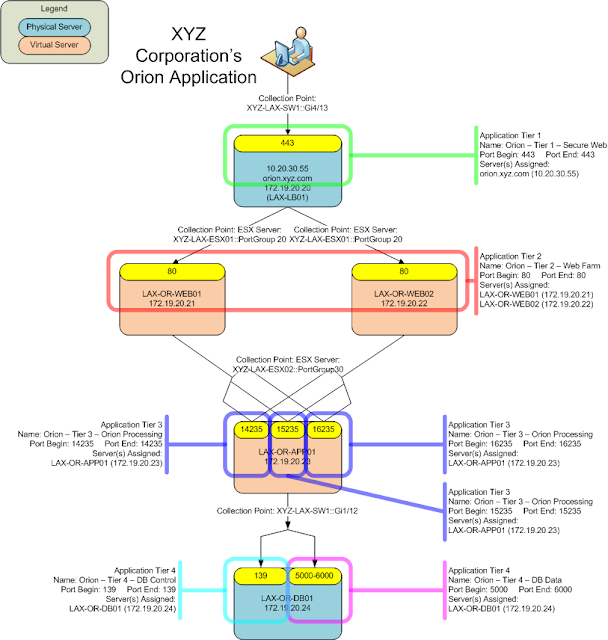 The fictitious XYZ Corporation's primary business application is the Orion application, which processes orders from customers. The primary interface is web based and is used by the sales people out in the field. XYZ Corp's IT department has implemented modern technology including load balancing appliances, VMWare, single-server multiple engine configurations, control port applications, and SSL. The application infrastructure is linear as far as the data flow. There are four tiers, each dependent on the next tier. The first tier of the application is a load balancing appliance similar to an F5 BigIP. 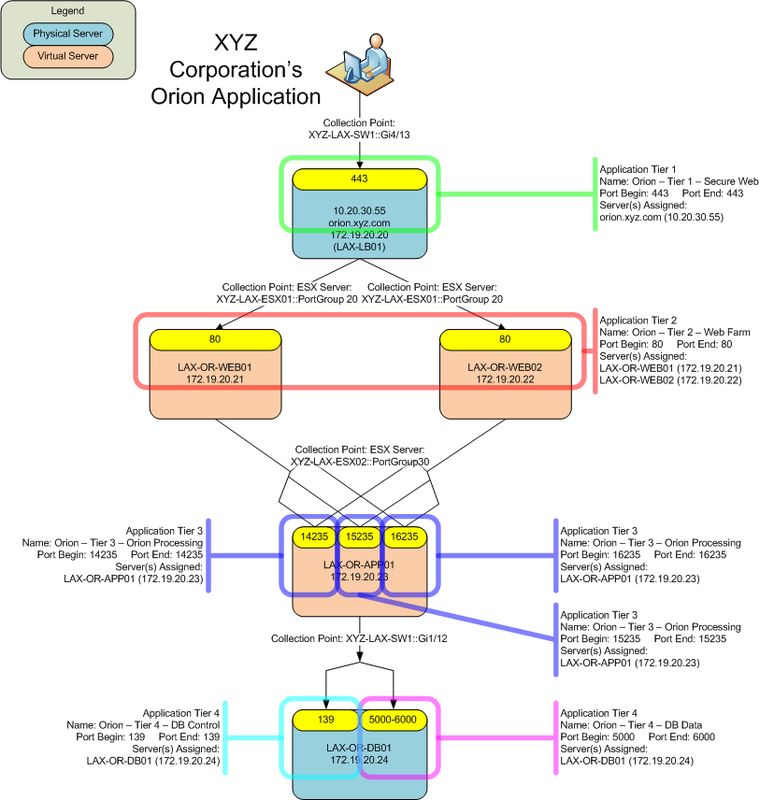 That load balancer is hosting a VIP and application port: 10.20.30.55:443, which has a FQDN of orion.xyz.com. The connection from the end users to the load balancer uses SSL, which is terminated on the load balancer. The front end network connection of the load balancer is a physical connection to the XYZ-LAX-SW1 switch on port Gi4/13. The load balancer users both destination and source IP address translation. The back end network connection of the load balancer is a physical connection to the XYZ-LAX-SW1 switch. The next tier consists of two web servers in a server farm, hosted on a single VMWare ESX server. Their network connection is through port group 20 on the ESX host. The connections through the load balancer to these servers are clear http on port 80 and are identical regardless of which web server services the request. The third tier consists of a single application server hosting three instances of the application processing engine. Each engine is bound to a unique TCP port. This application server is hosted on a different VMWare ESX server from the web server farm. The requests to the individual processing engines are identical regardless of which engine services the request. The load balancing strategy is built into a proprietary protocol between the processing engines and the web server, similar to a round-robin strategy. connection. After connecting to the control port (TCP 139), the server instructs the client to connect on a specific TCP port within the range of 5000-6000. The control session is then terminated and the data connection is established from the client to the server. In order to monitor the Orion application through CA Application Delivery Analysis (SuperAgent), the traffic between the various tiers must be captured in the form of a live packet capture. In order to obtain the most accurate measurements, the data collection should be configured to capture the data as it goes into and out of the servers' network cards. The CA Infrastructure Global User Community hosts details around best practices for data collection in complex scenarios. These best practices should be taken into consideration when planning the data collection strategy. The collection strategy is outlined in the table below. In the case of the physical collection, data collection aggregators may be used, as long as the aggregators do not add significant jitter to the packet arrival times at the collector. In the case of the Orion application, the data collection for the first tier of the application should be performed at the Gi4/13 interface on the XYZ-LAX-SW1 switch instead of the core switch or a DMZ switch and should be sent to a physical collector. This could be done by way of a SPAN aggregator so long as the aggregator doesn't induce significant jitter in the captured packets. 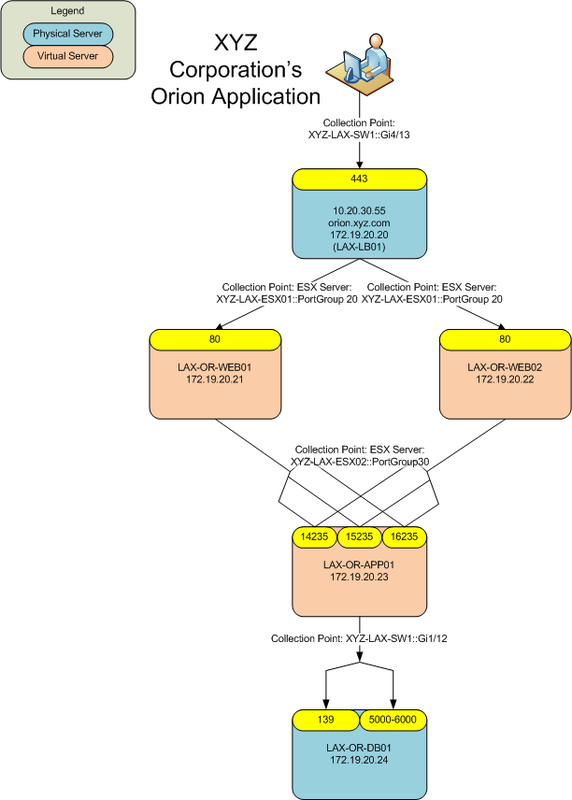 For the third tier, collection should be performed on a vCollector assigned to XYZ-LAX-ESX02::PortGroup30. This is a better vantage point than the vCollector assigned to XYZ-LAX-ESX01::PortGroup20 since it is closer to the server. Technically, the communication between the web servers and the app server will have to be routed via a layer 3 device since they belong to different port groups (VLANs). This means that this communication will probably reach the physical environment where it could possibly be collected without the need of a vCollector. However, if vMotion is configured to reassign servers automatically and one vCollector is already in use to capture the tier 2 traffic, vCollectors must be deployed to every ESX host. In this case, there will already be a vCollector on XYZ-LAX-ESX02. In that case, both vCollectors on both ESX hosts will see the data and send the result up to the CA Application Delivery Analysis (SuperAgent) master console. The master console will compare the data and figure out which has the better point of view and use that data. This is the preferred mechanism for monitoring servers that can 'move' via a mechanism like vMotion. The last tier of the application is the physical database server and would be monitored via normal physical means (a SPAN on XYZ-LAX-SW1 including Gi1/12 as a source interface). In a physical collection scenario, there are two possible contributors for this type of information: (1) the server administrators or (2) the network engineer. This usually depends on the internal division of labor between the server administrator and the network engineer. If the server administrators are involved in making decisions about the connections to the network, they may have this information. More than likely however, the network engineer will be able to provide the information pertaining to the ports on a switch into which a server is connected. In a virtual environment, usually the VMWare administrator will know which ESX server and which port group are involved with a particular server or set of servers. The contributors should keep in mind that the goal of CA Application Delivery Analysis (SuperAgent) collection is to have a vantage point as close to the server NIC as possible. There are two people who need this information, depending on whether the collection point is virtual or physical. If the collection point is physical, the network engineer responsible for setting up the SPAN session on the switch will use this information to ensure the proper physical ports are included in the SPAN to the collector. If the collection point is virtual, the VMWare administrator will need this information in order to setup the virtual collector and the monitor port group for data collection. For more details and other considerations, see chapter 14 of the CA Application Delivery Analysis (SuperAgent) Administrator's Guide. VMWare's vMotion adds a layer of complexity to this situation. If vMotion is configured to automatically migrate servers without administrator intervention, CA Application Delivery Analysis (SuperAgent) monitoring must be enabled on every ESX server involved. This means that each ESX host must have the monitor port group configured, each ESX host must have a licensed vCollector, and vCollectors should be pinned to a particular host.